Carlos will be back on the Phils especially in the St. Patty's Day game this year! 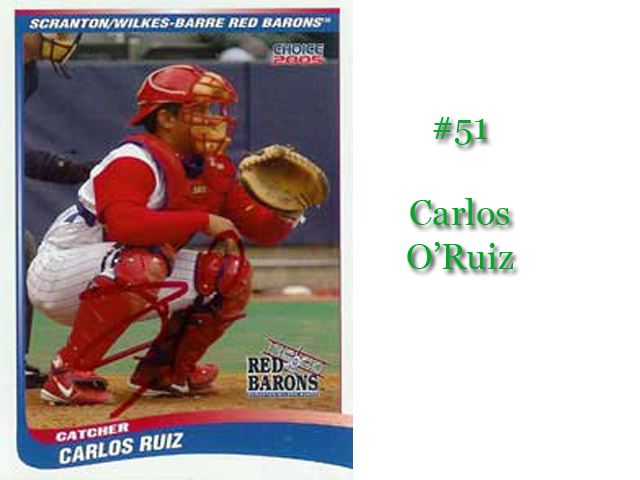 Carlos Ruiz finally received a great payday in this day and age where you can be an 'above average' ballplayer and never have to think about work after the game of baseball is over. That wasn't always the case in baseball, but for Carlos Ruiz, all of his hard work with the Phillies was paid off in a handsome 3 year deal. You have to hand it to the Phillies for this one, Chooch has been one of the unsung heroes of the Phillies in the past 5-7 years, he's been a team player and though he's had a run in with the PED's, which I am not so sure was intentional, he's paid his sentence and now he continues his baseball career and it should be retiring with the Phillies now with this 3 year deal at $26M with an option for 2017 with a $500K buyout - is a great payday for Chooch. Where I have an issue with the Marlon Byrd signing at $16M, I don't have an issue with Chooch getting his nice $26M payday, but both players are considered on the 'old' side and we all know that the Phillies needed to get younger. They haven't succeeded with this yet. Cole Hamels was quoted in the media just yesterday saying that he thought Chooch deserved to be in Philly, and now he will be. Just like old times, I wish they'd start playing like the 'old times' that we remember them playing like, with a healthy Ryan Howard, and plenty of offense to go around. We'll see what happens in 2014 with these additions.